I try not to be a creature of extremes. Mostly because it leads to a less than peaceful life, but also because, given enough time, such extremism turns me into a screeching harpy with no sense of proportion. And no one wants to be a screeching harpy. It's just unattractive. So this year, I'm trying to make an effort to explore areas in which I have extremist tendencies and learn more about the other side of the argument. I'm doing this in an attempt to reach a happy median in my viewpoint. First up on the agenda is the subject of religion, specifically religion in public life. When this subject comes up, even in the most non-confrontational ways, I tend to get defensive and wrapped around the axle. If the subject becomes teaching religion in public schools or someone insisting the United States is a "Christian Nation," I get downright stabby. So I'm trying to get a handle on my feelings about this, and try to determine what aspects of this topic deserve a passionate response, and which I should learn to let go. 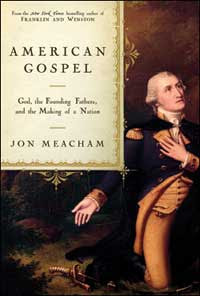 In that vein, I just finished listening to American Gospel by Newsweek editor-in-chief Jon Meacham. This book takes an historical look at religion in American public life, examining the historical context of the founding fathers' beliefs, and the inclusion of a "God of Providence" in their endeavors to create our nation. He's an equal opportunity slammer, and spanks the evangelical Christians and the rabid atheists equally. The evangelicals for trying to co-opt our nation's founding into their tired "America is a Christian Nation!" nonsense, and the atheists for interpreting the separation of church and state to mean the separation of religion and/or faith and state. In Meacham's view, there's a place for religion and faith in public life and in government. The vast majority of our population believes in some sort of god, and he contends that including the perspective of faith in the public discussion is appropriate, providing its inclusion does not constitute hypocrisy or exclusionary practices. I found this book to be even-handed and thoughtful, drawing on historical references and current events to make the point that people really ought to be better informed before they get on their high horse and complain that there's too much (or too little) religion in public life. So I'm reevaluating my position. Intellectually, I think the yardstick should be threefold: If a policy is made on the basis of religious belief and that religious belief is clearly demonstrated to contradict scientific consensus (cough, intelligent design, young earth creationism, cough), then getting stabby is the appropriate response. If a group attempts to teach their faith in public schools, then someone's losing an eye. And if the inclusion of religious belief is exclusionary (cough, Rick Warren, cough), then I'm breaking out the cutlery. I'm going to try and let go of well thought out, inclusive, ecumenical demonstrations. An example of this is Bishop Gene Robinson, whose prayer yesterday at the Lincoln Memorial was inclusive, thoughtful, sincere, and written in such a way that even an agnostic like me can support the sentiments. I must get that book. I find religion fascinating--from an outsiders perspective. In a way, I think I'm perhaps a little jealous of those who have faith, because it feels like sometimes I'm missing something. Which is why I tend to be far more accepting of religion in public life. Doesn't mean evangelicals don't make me want to kick someone in the shins, but I do think that religion plays an important part in the lives of most Americans--including politicians. My wish, however, is that before people start pointing out motes in other's eyes, they remove the beams from their own. Also, I really do think you have grounds to complain about the flower arrangement you sent Nathan--because the nature of prayer in Judaism is different from the nature of prayer in Christianity. Although we're amused by the idea of thanking G-d for Nathan's zombie pancreas, others might not be so amused in a similar situation. Michelle, the book was excellent - you'd probably enjoy it. One of the lines from The Bucket List that I really enjoyed was when the guys were discussing faith, and Edward said, "I envy people who have faith, I just can't get my head around it." I'm settling into this point of view. Also, I did send a note to 1-800-Flowers about the balloon, just because it was so wildly inappropriate (and clueless). I'll add it to my wishlist (I think I've done more than enough spending this month). Also, if you haven't read her before, I adore Karen Armstrong's books, and think she does a very good job of discussing religion from an historical perspective. Because I think it really could be upsetting to someone else. And that's just not right. Michelle, I've read "Jerusalem" by her. If you want a look at modern politics, "The Battle for God" is excellent, though my favorite may be "A History of God"
I think that's a good position to take. My actions and opinions are informed by my faith, but I have no desire to live in a theocracy. I'm not sure I could find one that would be a cross between how I understand Christian should act and believe and Robert Heinlein's philosophy as outlined in "The Moon Is a Harsh Mistress." Does this mean you're not praying for me anymore? Nathan, apparently someone from 1-800-Flowers is praying for you. Hmmm. Now you've given me some new books to read. I, too, find the whole concept of religious faith to be interesting but completely divorced from my own brain (and/or mind). There are times that I wish I had faith and received comfort from it, but those times are few and far between. My Nerd Love Rawks the House!